Samsung's new line of connected home products are now available to buy in the UK, with the Starter Kit and individual sensors available both online and in store at Currys PC World and Samsung.com. Works With Nest is up for a T3 Award and HomeKit is about to give us Apple's take on the smart home. But today Samsung announced its plan to invade your living room, splatter it with sensors and give control of everything short of the dog to your phone. Welcome to the SmartThings platform and range of connected devices. The system is based around the SmartThings Hub, which will be the new beating heart of your connected home. The Hub plugs into the back of your router and wirelessly connects hundreds of compatible devices, letting you monitor, control and secure your home from a single app. The SmartThings app will be available to download from September 10, and will give you notifications about what's happening at you home, the ability to control all compatible devices, and set up and automate certain tasks. The app will be available for Android, iPhone (yes, you read that correctly), and (perhaps even more surprisingly, some would say) Windows Phone. You may be surprised to see that the platform is compatible with iOS, but Samsung is keen to stress that it's trying to make the platform as open as possible. That's also, perhaps, to draw attention to the fact that Apple is keeping things more 'closed' with its HomeKit platform, which will probably mean a better experience, but from a smaller range of products, at least initially. The good news is that HomeKit compatibility doesn't rule a product out from working with SmartThings (or any other connected home system), and vice versa. The bad news? Soon there'll be so many 'Works with…' badges on product boxes, there'll be no room for a photo of the product. 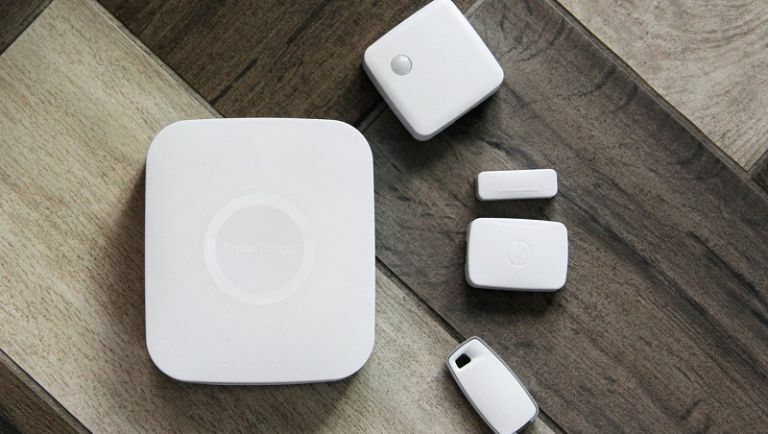 The main manifestation of SmartThings' openness is that the platform will be compatible with existing smart home/automation protocols, such as Zigbee and Z-Wave. What's slightly sketchy at this point is how integrated these products are, because Samsung is also inviting brands to create specifically compatible devices for deeper integration into SmartThings. It's already signed up the likes of Bose, Philips Hue, Honeywell, Yale, LIFX and Aeon. Although many of these products will have their own apps, they will all be controllable, at least to some extent, within Samsung's smart-looking app. A Multi Sensor (£30) which detects whether doors, windows, drawers and so on are open or closed. A Motion Sensor (£30), which detects motion. Obvs. A key fob-like Presence Sensor (£30) to alert you if your phone or children stray too far, or let you know when the latter have returned home from school (£30). A Power Outlet (£45), which lets you turn on plugs remotely. If whatever's plugged in to the Outlet turns on as soon as it receives electricity, this effectively makes previously dumb appliances smart. Because they're plugged into the mains (the other devices use watch batteries), these also draw enough power to act as Wi-Fi repeaters. One of each of the above can also be bought as a Starter Kit for £199. Not included in that, but available for £30, is the Moisture Sensor, which tells you if you have had a leak, or the Thames Flood Barrier has failed. A number of the sensors also include thermometers, which could work well in conjunction with your smart thermostat. Apart from having a wider range of products at least to some extent compatible at launch than HomeKit, the main bonus that the platform opens with is support for cameras. Apple is holding off on that until it can resolve qualms it has over security, privacy and, presumably, huge amounts of video data potentially clogging up iCloud. Clearly this range is not cheap enough for most people to make everything in their abodes smart - hilariously, part of the creative spark for SmartThings came from a Samsung bigwig's holiday home being flooded and him not knowing about it until he next visited the place. But it does mean that people can begin the process with a plug or two here and a sensor or two there. More importantly, like HomeKit, SmartThings begins to bring together previously disparate smart home products under one platform, which at least makes full house remote control seem like an exciting idea as opposed to a massive headache.